BITS's 0.5W LED Night-Light with Photocell is 90% more efficient than a 7W incandescent nightlight. 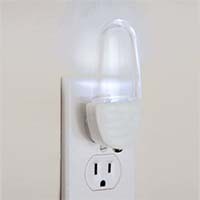 The integrated photocell will automatically turn the light on at dusk, and off at dawn. These night lights can be imprinted with custom logo. Minimum purchase of 600 pieces required.